CONCORD, NORTH CAROLINA (January 31, 2017) – Tom Hessert, the popular 10-year veteran of the ARCA Racing Series presented by Menards, announced today his return to Venturini Motorsports (VMS) with an abbreviated 2017 race schedule beginning with the series’ season opener at Daytona International Speedway. Coming off of a career best, second-place finish in last year’s ARCA National Championship standings, Tom Hessert will return to the series for five selected events in 2017. With six ARCA victories in 179 starts, Hessert is slated to pilot VMS’ No.25 Toyota at Daytona Int’l Speedway, Talladega Superspeedway, Illinois State Fairgrounds, DuQuoin State Fairgrounds and the Fall Salem Speedway race. 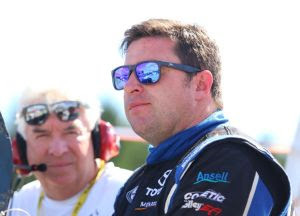 Hessert, a native of Cherry Hill, NJ, has proven himself as one of the elite drivers in the ARCA Series with wins at Talladega Superspeedway, Iowa Speedway, DuQuoin dirt mile and three times at the historic Salem Speedway. A product of road racing and open-wheel midgets, Hessert is a six-time series winner with 53 top-5 and 106 top-10 finishes throughout his ARCA career. During his first full season driving for Venturini Motorsports, Hessert doubled his career numbers earning two pole positions – Talladega Superspeedway and Berlin Raceway – and winning his sixth career victory at the DuQuoin State Fairgrounds dirt mile, enroot to his 2016 runner-up Championship Standing finish behind championship driver, Chase Briscoe. Not ruling out a full season return in 2018, Hessert knows his partial schedule will be difficult at times. In addition to his racing career, Hessert maintains a busy schedule as General Manager within his New Jersey based family owned Barbera’s Autoland car dealership. Hessert will make his 10th Daytona Speedweeks appearance on Saturday, February 18th during the 54th annual Lucas Oil Complete Engine Treatment 200 driven by General Tire at Daytona Int’l Speedway.